Executive Risk Control has over 20 years’ experience as a commercial security service provider to South African businesses. Based in Middelburg, they supply the local businesses with security guard services. Executive Risk Control offers a national service as well, monitoring the business premises of their clients from a central control room. After 15 years in the commercial security industry, Executive Risk Control changed ownership when Francois Naudé bought the business and started managing it 5 years ago. This would see Executive Risk Control grow at a rapid rate, starting with 66 security guards at that time, to now having 250 guards patrolling and protecting businesses in the Middelburg area. Executive Risk Control was founded on values such as quality, integrity and honesty. Values that echo into their business operations to this day. They strive to offer the best, personalised service to all their clients. Executive Risk Control’s operations are two-fold. They supply quality security guard services to businesses located in the Middelburg area and monitoring services nationwide. Their security guards receive comprehensive in-house training before they start working in the field. Executive Risk Control has organised transport for each guard from their home to work, and back again. Before patrolling, the guards go through parades where the Shift Manager checks if they are sober and correctly dressed. The Shift Manager then issues radios, and gives them instructions. Executive Risk Control also installs patrol systems around the country. These systems are tamper proof and can be operated by any guard company. The system is monitored in real-time from a centrally located control room and clients are notified as soon as a problem arises. To be the best security service provider, have a security guard patrolling every business in the Middelburg area, and install monitoring systems at numerous locations around South Africa. To provide security with a difference, personal service and the best possible protection for clients’ business properties. 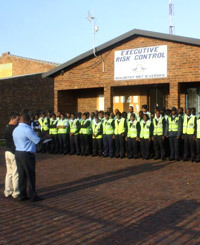 As a commercial security service provider in South Africa, Executive Risk Control is not only dedicated to protecting business properties in this country, but uplifting the previously disadvantaged community as well. We currently hold a Level 2 Contributor to BBBEE status.